Overturning District Court verdict, Israel's Supreme Court rules Zionist movement cannot be libeled with having 'fascist' characteristics. The Israeli Supreme Court ruled Wednesday that the grassroots Zionist movement Im Tirtzu does not have fascist characteristics, overturning a Jerusalem court ruling from 2013. The case began when Im Tirtzu sued the Facebook group "Im Tirtzu is a fascist Movement" for libel; the Jerusalem District Court ruled that because Im Tirtzu could be likened to fascism, it was not libelous for the Facebook group to refer to it as such. But today, Justices Menachem Mazuz and Anat Baron determined that the District Court's ruling is null and void as Israel's courts have no such authority to handle arguments of ideology. 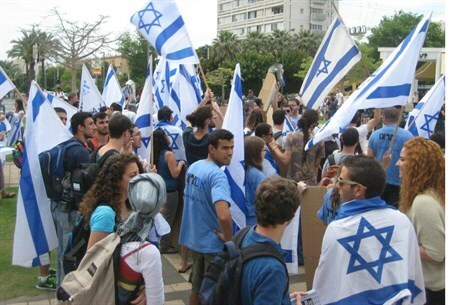 Im Tirtzu's chairman, Matan Peleg, praised the verdict, thanking the "Israeli Supreme Court for clearing our name," and noting the movement's intentions of continuing "to struggle in the fight for strengthening the values of Zionism in the Israeli society." "The Israeli Supreme Court’s decision does more than just clear the good name of the Im Tirtzu movement, it also clears the good name of the founding fathers of Zionism and its leaders in the new age,” Peleg added. “More than just Im Tirtzu's good name has been preserved, the Israeli Supreme Court saved the good name of the entire Zionist movement," Shoval asserted.